There’s nothing like slipping your feet into a good pair of slippers or moccasins when you want to relax. Sadly, the market is flooded with low-quality products that don’t offer great comfort or durability. That’s why we took the time to find the best slippers and moccasins made in the USA. Through rigorous research we put together a list of tough, stylish, and comfortable footwear. Our top picks and the factors we considered in our research are below. Through extensive research, we landed on six different brands who are truly making the best slippers and moccasins in the USA. A few trends stood out to us. First, there are a ton of low quality options out there where the material will fall apart on you very quickly (we obviously avoided those products). Second, the style options are pretty much endless when it comes to slippers. So, we did our best to categorize our top picks into some themes and styles that should help you make sense of all the options available. Below are reviews explaining why each of our top picks stood out from the rest of the options. You’ll find a ton of detail about each of our top picks, what we liked, what we didn’t like, and where to get them. We were impressed with the Janska MocSocks the first time that we tested them out. This American made product will keep your feet warm and comfortable at home. 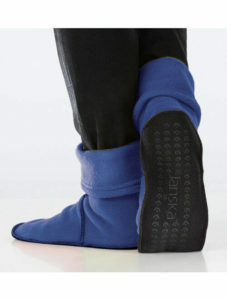 These slipper socks are made from soft-touch fleece and very gripping soles for excellent traction on smooth surfaces. We were impressed with the sturdy design of these slippers as well. Typically, slipper socks are prone to holes and tears, which was not the case with this pair. They feature heavy stitching, double layered fleece bottoms, and a thicker cuff around the upward edge. The slippers are built to last and they’re engineered for comfort as well – seams are kept smooth inside. They’re offered in seven different colors and four different sizes for a good amount of customization. These slipper socks are a good mix of value and function. These handcrafted moccasins from Itasca are made from fine leather and designed to offer comfortable performance. They feature double rubber soles built for indoor and outdoor walking with a grippy texture to help with traction on smooth surfaces like hardwood. The moccasins feature 100% natural leather uppers made from full-grain cowhide for tough performance. This footwear is made with a slip-on style that’s convenient for quick use. We were impressed with the different color finishes available and the quality of the leather used on these moccasins. They have an attractive authentic look and can be sized well for most feet. They’re tough and should hold up well through extended use as well. 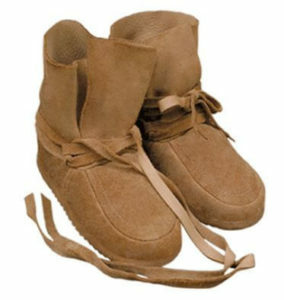 These moccasins are costly, but they are worth the investment for their durability and usability. During our research, we came across the Steger mukluks and moccasins and we were impressed with their versatility, perfect for everyday use. This smooth footwear is made from tough moose hide and has an attractive appearance. They come in earthy tones and showcase the rich appearance of natural hide. Each of these moccasins features thick rubber soles with moose hide uppers. They manage to remain cool when used during warmer weather, and offer just the right amount of insulation for cooler weather as well. Just slip them on before heading out the door, and enjoy comfort in most moderate to cool temperatures. You can make the most of tough, but supple sheepskin with these Seattle Scoots from North Star Trading Co. Seattle Scoots. These durable slippers are fitted with a thin EVA sole that’s slightly ridged for excellent gripping potential. We like that they are offered in standard shoe sizes, making it simpler to get a good accurate fit. The slippers are only sold in whole sizes though, so you will have to purchase the next size up if you normally go with half sizes. These slippers are designed for maximum comfort and were one of our favorites in terms of feeling when worn. Each pair is seamless inside, and made of soft-touch material in every area where they will come into contact with your skin. If you’re searching for slippers offering maximum comfort, the Seattle Scoots would be a good contender. We had the pleasure of chatting with North Star’s Nick VanDyke recently, who gave us some awesome insights into their American roots. “This is our 40th year in business here in the Pacific Northwest. We had the good fortune to grow and evolve in the tight-knit craft community of the Pike Place Market in Seattle and, to this day, still hand make everything on nearby Whidbey Island. Ours is a family company and over the years we have continued to develop an amazing relationship with our customers. It is our hope that everyone that orders from us will enjoy their slippers/hats so much that they HAVE to share the experience with the ones they love.” Love it! 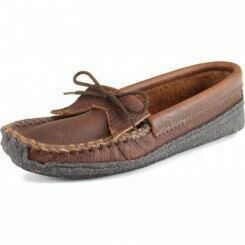 We’re big fans of the versatility of a full leather moccasin, and the Wassookeag moccasins top our list as the very best leather moccasins that you can get for your money. These beauties are made of four different layers of leather and use a mix of bull hide leather and deer leather for a soft, but tough quality. Each moccasin is fitted with a triple leather sole, complete with a resilient 8 to 9 ounce bull hide upper, vamp, and outsole. 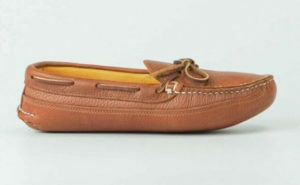 These moccasins feel very solid in the hand and they feature hand-stitched construction using tough rawhide. They’re made in a similar style to classic moccasins and feature enough leather hide to hold up to outdoor use very well. We love these moccasins because they use a supple deer hide on the inside and are fully breathable while still keeping your feet warm. They’re our favorite leather moccasins and well worth their cost. You can give your kids the gift of good natural comfort with a set of American made WindWalkers. 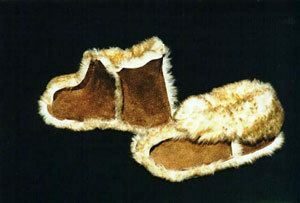 These slippers are made with either leather or sheep skin, making them impressively durable, but also soft. The footwear made for older children comes with leather soles while the slippers for infants and toddlers is equipped with a sheepskin sole. These slippers are quick and convenient to slip on and can hold up over time. The only downside to these is their inexact sizing, which can be a bit of a pain to find the right fit. When evaluating slippers or moccasins, your first concern should always be the type of sole that’s used. The sole is the only thing separating your foot from contact with the ground, and largely determines how the footwear feels to walk around in. We evaluated the different options based on what the sole is meant for and how well it holds up to its true purpose. For an outdoor moccasin or slipper, we looked for a thick sole that’s waterproof and built to withstand walking against rocks and other abrasives. Rubber soles or very thick hide soles are best in these situations. For an indoor slipper or moccasin, we looked for soles that are as soft as possible while still being durable. We liked double bottom soles with a pliable leather on moccasins, or a lightweight padded sole in a slipper for indoor use. When selecting a good moccasin or even a slipper that’s composed of leather, it’s imperative to get a product that doesn’t skimp on leather quality. We looked at the type of leather, as well as the actual grade and thickness. We prefer to go with full-hide or suede leather all the time. These are generally the two best options and will hold up the best long-term. Low-quality leather stands out immediately because it is thinner, has a fake plastic look to it, and simply won’t hold up when worn for long enough. Good leather is thicker, more supple, and just has a good feel in the hand. We look closely at the build quality of every piece of footwear that we review. While evaluating the construction of these products, we examined the level of stitching and the materials used in the process. We prefer moccasins held together by hand-stitched rawhide for its strength, but have also seen high-quality machine-stitched moccasins that hold up well over time. The important factor is that the stitching goes into thick hide, and the stitching is heavyweight enough to hold up to long-term use. When selecting non-leather footwear, we looked to see the material used at attachment points is thick and durable. We looked for thick stitching that doesn’t look out of place, and stitching that helps spread out pressure for even and comfortable performance that withstands quick movements and hard use. Looks are subjective, but we only selected footwear that we believe looks stylish and can appeal to a variety of different people. This means that we selected products made from nice looking materials styled properly and stitched neatly. Finally, we looked at the comfort of the slippers and how they felt while wearing them. We verified there are no rough spots within the footwear itself, and we also verified that the insole feels nice and soft. We also take time to evaluate the fit of each product, making sure that they stretch out properly for a nice snug fit that’s supportive, but puts minimal pressure on the feet.